I am often inspired by other food bloggers. This great recipe comes via a recent post from Susan at Food Blogga. I was drawn to the combination of rich, sweet and smokey flavors -- perfect comfort food for cold, blustery days. I'm also a sucker for anything that involves maple syrup and bacon. And I could not pass up another good way to use up the enormous yams we keep receiving in our produce box. 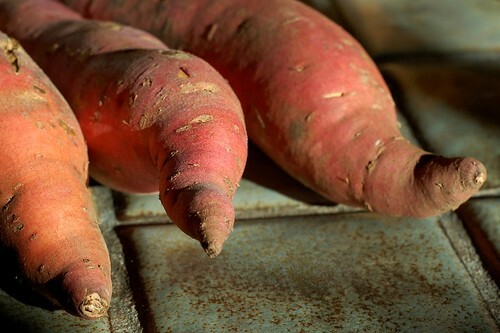 These yams are kind of addictive -- my husband and I kept sneaking extra spoonfuls after dinner. 1. Preheat oven to 400 degrees. Wash the yams and cut in half the long way. Brush the flesh of each half with a little bit of olive oil. Place flesh-side-down on a heavy baking sheet and roast until soft when poked with a fork -- 20-25 minutes. 2. 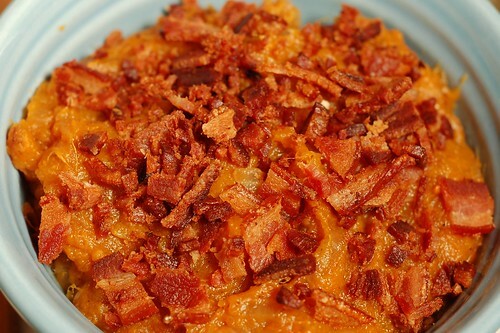 While the yams are roasting, lay the bacon slices in a heavy skillet over medium heat. Cook, turning often, until browned and crisp, about 6-8 minutes. Transfer to a paper-towel or paper grocery bag-lined plate to drain. Let cool completely then chop into small pieces, setting a tablespoon or so aside to use as a garnish. 3. Once the yams are cooked, remove from oven and cool for 5-10 minutes. Scoop out the flesh, mash lightly and set aside. 4. Heat the left over bacon fat in the skillet over medium heat then add the sliced onions and brown sugar; stir occasionally, until the onions caramelize and turn a deep golden brown, about 10-12 minutes. Add the beer and cook for another 2 minutes. Add the maple syrup, stir well and cook 3-4 minutes. Add the yams and bacon to the skillet and season with freshly ground black pepper and salt to taste. Stir well. Garnish with a little bit of chopped bacon and serve warm. Thanks for all these great recipes with pics! You are posting them faster than I can prepare them, but keep them coming. You had me at bacon and beer but (now) am a pregnant vegetarian. I can't remember how I originally stumbled across your blog, but I'm glad I found it and put it in my Google Reader. I made this recipe last night for my roommates, and they've declared it Thanksgiving-approved. I added an extra yam, and more beer, and it was delicious. so glad to hear it! Perfect for a yummy fall holiday.